Our product range includes a wide range of elastic solar power pack, solar converter - elastic solar power pack and solar power pack. We are one of the major manufacturers of ELASTIC SOLAR POWER PACK. If you own a UPS/Inverter which is in good condition with a good backup, you can take advantage of Solar Energy by simply installing ELASTIC SOLAR POWER PACK to utilize solar power and save on energy bills. ELASTIC SOLAR POWER PACK is a smart device, based on patented technology, which can convert any ordinary inverter and battery setup into solar power system. It lets you use the free and green energy generated by solar panels to power all your electrical equipment. You make huge savings on electricity bill and get the uninterrupted power supply throughout the year and of course help save the environment. 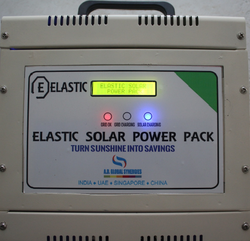 ELASTIC SOLAR POWER PACK SYSTEM, has a built in converter and charger system, and is connected to your existing setup of inverter and batteries. During the day, when solar power is being generated,ELASTIC SOLAR POWER PACK intelligently disconnects the mains and powers your house via inverter using the solar power. You take almost nothing from the main power supply which means your electricity meter stops – more savings for you. ELASTIC SOLAR POWER PACK, which comes with solar panels and patented structure with complete fitting hardware, thereby making it very easy to install without disturbing your existing connections. During the day, when solar power is being generated, ELASTIC SOLAR POWER PACKintelligently disconnects the mains and powers your house via inverter using the solar power. You take almost nothing from the main power supply which means your electricity meter stops – more savings for you.